Yesterday morning, I had the privilege of sharing a few words of encouragement to a local moms group that I am a part of. I planned a little something over the weekend, but then I woke up Monday morning to the news of all that had happened the previous night in Las Vegas. Listening all day to updates, I felt a heaviness I just couldn't quite shake. Thinking again about the morning's conversation with the women and what I would share, I realized that, to me, love and kindness and acts of kindness sometimes feel weak or insignificant in the face of such blatant violence and anger. And it makes me wonder, Does what I do really make a difference? This past Sunday, our faith community was having a conversation about times in our lives where we had a moment with God that changed us. And as I sat and listened to others share around the circle, I found myself thinking, When has God shown up in my life? The memory that came to me actually happened several years ago at a time when we were challenged to start building relationships with people outside of our church walls by showing kindness and hospitality to neighbors, co-workers—anyone we came into contact with on a regular basis. My husband and I decided we were going to get to know our neighbors, which was slightly awkward since we'd lived in our home for many years with little more than a wave to those who lived closest to us. But we decided to walk across the street to talk with an elderly man who lived alone. There was nothing profound in that single conversation or that moment—the heavens didn't part with a choir singing, there were no smoke or lights visible—there was no fanfare, and at the time I did not think anything of it. But now, looking back, I see how that one small step of kindness and hospitality toward someone I did not yet know was exactly the moment when my faith journey shifted. The trajectory of my life, and my family’s life, changed in that moment because we started to see people outside of ourselves. Because it was then that I saw how loving people and extending welcome to them—even if they were very different from me—was something I’d been missing in my faith walk. For me, it opened up my eyes to how much Jesus loves people and, truthfully, it brought a new realization of just how much Jesus loves me. And that elderly man, our neighbor whom we first met that evening? He is now so dear to us. We don’t live in the neighborhood anymore, but we still see him often. He didn’t have children or grandchildren, but my kids' pictures hang on his walls. And it all began with one simple hello. Why do I tell you this in light of what happened in Las Vegas? 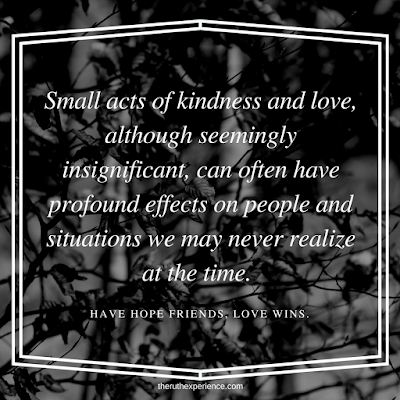 Because small acts of kindness and love, although seemingly insignificant, can often have profound effects on people and situations we may never realize at the time. What we do matters. How we love others and invite them in matters. How we show people God’s love matters. Have hope, friends, love wins. 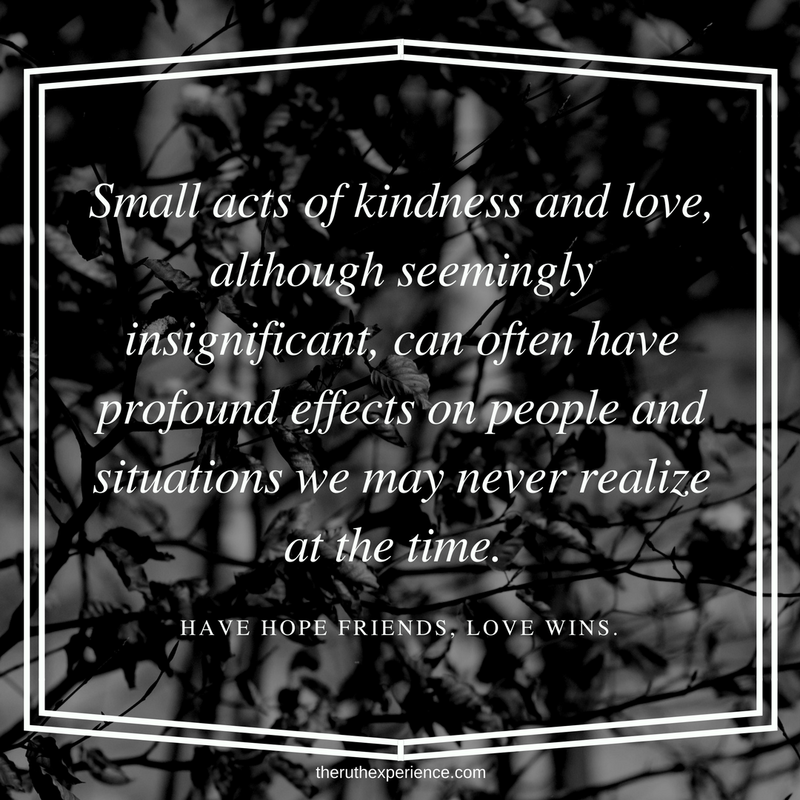 Looking for tangible ways to show kindness towards others? Our new book, The One Year Daily Acts of Kindness Devotional, releases October 17th and in it you'll find Scripture passages and inspirational personal stories about why God calls us to show kindness, what it means to live a life of generosity, and how you can incorporate kindness into your everyday routine (and teach it to your kids) with tons of simple, easy-to-do ideas. You'll find it wherever books are sold! Will You Leave a Legacy of Kindness?